A big THANK YOU to all of the day’s participants – sponsors, speakers, volunteers, and attendees! Without all of you the day would not have been a success! To the attendees – we certainly appreciate you sticking it out as we got behind schedule. To me, that’s a telling testament to the value you were experiencing throughout the day. For those who had to leave early, or who were unable to attend, Zi Teng Wang was presented with our Communicator of Science and Skepticism Award. Zi was the driving force behind this year’s event. And, it’s not like Zi just has tons of time on his hands. He’s a doctoral student at Washington University in St. Louis and he volunteers his time to spread scientific understanding at a variety of events through his magic show. But, as we know, there is no “I” in “team” and Zi had a dedicated team behind him working the details to make SkeptiCamp a success. Lance Finney helped us secure The Ethical Society of St. Louis as an event location and acted as our liaison with them. Karl Wulff proved he had some mad brownie-baking skills and could whip up a salad as a side to a yummy Pointer’s Pizza lunch. Meredith Rau showcased her retailing skills by finding the best deals on tshirts and notebooks as well as creating a lovely retail presentation for our merchandise table. Dave Blue and Marc Rau worked technical support all day to ensure our speaker’s presentations worked as intended. Last, Sara Patterson, Jamin Gray, Mike Hynes, and Mike Bateman all woke up early on a Saturday morning (some earlier than others!) to help with set up and then continue to help where needed throughout the day. THANK YOU to the 13 individuals who took the time to complete our survey about yesterday’s event! Nothing is ever perfect and so your feedback means a lot to us as we work to plan an even better event in 2016. Speaking of surveys, I have to bring up the $80/person figure that we published in the survey. As I was driving to Skeptics in the Pub, I was thinking about this figure…again…with my Thinking Cap on this time. I want to assure you that we are WAY better stewards of your donations than our $80/person figure portrays! No. We did not spend $80/person to give you SkeptiCamp. Where did we get that figure? I have no idea. Why were we not more skeptical of that figure? I don’t know. 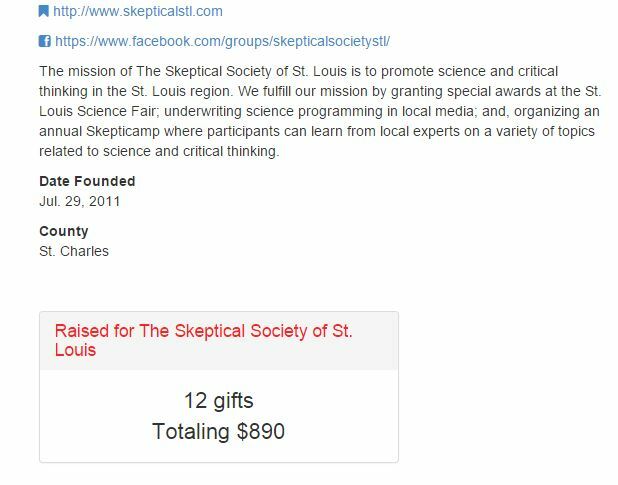 I believe in full disclosure so I will share with you what SkeptiCamp cost The Skeptical Society of St. Louis: $2,800. With nearly 100 attendees, that is NOT $80/person. Also, several surveys mentioned the Skeptic Magazine included within our goodie bags as a way to cut costs. We should have made it more clear that our thank you to Michael Shermer noted in the program was for those magazines. Mr. Shermer is the editor of Skeptic Magazine and writer for Scientific American as well as the author of many books including “Why People Believe Weird Things” and “Why Darwin Matters.” He was very generous and donated all copies of Skeptic Magazine that you found in your goodie bags. So, please, enjoy and, if you ever run into Mr. Shermer at an event, be sure to thank him for his generosity to our little skeptical organization. Last thought: We received at least one written comment, and I heard some hallway chatter, about some graphic videos presented by one of our speakers. I apologize if those videos upset anyone and assure you that we will do a better job vetting presentations so we can either ask the speaker to remove the items or, at least, provide a warning within the program. Again, thank you to all who made yesterday a success! The feedback I have received indicates you all had a darn good time and enjoyed your day. Do we have things we can improve? Of course! Will we work on those? Absolutely! If you have anything you would like to share about yesterday’s event, please feel free to private message me on Facebook or Meetup or send an email to skepticalsocietystl@gmail.com.